Have you ever driven through a neighborhood in the evening and noticed that some homes stand out among the others? They have impact. They draw your attention but also exude tranquility and comfort. They display a sense of security. That’s landscape lighting. Whether you’re going for mood, for assurance, or for both, look to landscape lighting to deliver a package deal. Total Sprinkler and Lighting installs commercial grade products to ensure long lasting effects. These lighting packages are low-voltage and can be run on a transformer equipped with a photocell. That means that the lights turn on at dusk and turn off at sunrise. No need to manually turn them on each night. Talk about hands free. 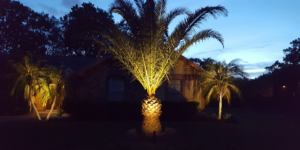 Give us a call today to schedule a walk-thru to see what landscape lighting can do for you. Installations can be completed in about one day but the effects carry on for years. That is the commitment Total Sprinkler and Lighting makes – one that endures.